Have you ever had Stromboli? 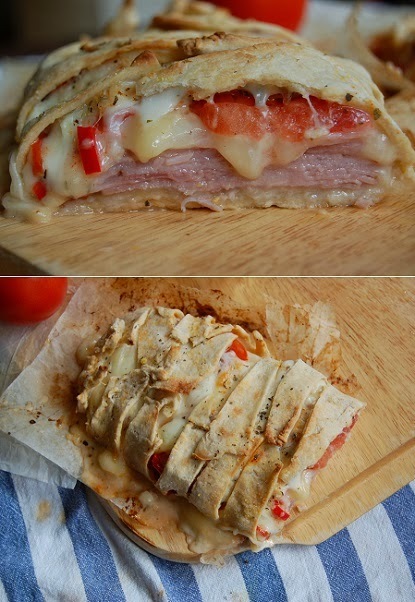 It's like a huge pizza pocket, much like a Calzone. It's a hard rascal to define but it’s mind-blowingly delicious! Whenever Balazs and I feel like something soothing, we usually end up making this take on Stromboli. It's as comforting as pizza, but since it's made entirely from scratch, it's incredibly satisfying and special. I know what you are thinking: pizza dough made from scratch takes forever. Well, no! A few months ago I spent 3 days mastering an easy-peasy pizza dough recipe and I came up with this killer 5 minutes Italian pizza dough. No resting time, no endless kneading, just 6 ingredients and 5 minutes of your time. Ok, back to the Stromboli! You can mix and match the topping as you like. We usually go with ham, cheese and some veggies but if you prefer salami, seafood, eggs, chicken or turkey meat, you can add those too. It’s totally up to your imagination. Here is my take on it if you fancy something wonderfully autumn-y tonight for dinner. Enjoy! (Recipe for the filling inspired by What Should I Eat for Breakfast Today. Recipe for the pizza dough by exPress-o. Makes one loaf). Let’s start with the dough, drop all the ingredients for the dough in a mixing bowl and knead until the dough becomes smooth and rubbery - about 5 minutes. Then, roll it out super thin on top of a baking paper and spread your toppings along the centre. Sprinkle salt, pepper and oregano to taste. Make sure to leave some space on the edges so you can cover the ingredients with dough. With a knife cut the edges of the dough in stripes. Fold the top end first, then criss-cross the stripes from both sides, then fold the other end. Drizzle the loaf with a dash of olive oil and sprinkle it with additional helping of oregano. Bake it for about 13-15 minutes on 350F (180C). Ta dah! Tip: Balazs and I love to use corn starch for the bottom of the dough for that pizza-like crisp crunch. If you fancy trying it too, just spread a bit under your rolled out dough. It will stick by itself to the dough while baking. P.S: Plus, baked brie bites. P.P.S: And plenty more scrumptious delights. Diana this looks epic! Since I don't eat meat I will make one with cheese and vegetables and your pizza dough recipe of couse. You don't even know how much I would love that right now. Sigh. Aww thank you, Ola:) You're so sweet. Tiffany, you should totally make it. I think you will love it.